That is because of the tusk, the boy said, his eyes watering. It was the tusk that did the damage. What if I return it? Can’t I reverse the curse? Oh my sweet stupid son, there is no reversing a curse, everyone knows that. But who says we cannot turn this curse into a blessing? Elephants do not breathe smoke and fire, they are not gods, and they certainly do not go around in the middle of the night knocking down people’s homes and singling out particular human beings for premeditated murder. 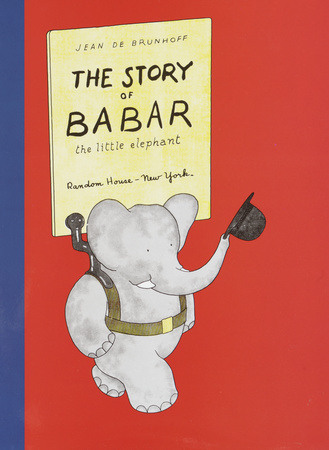 Elephants are kindly, intelligent, generally good-natured creatures, like Babar and Dumbo. 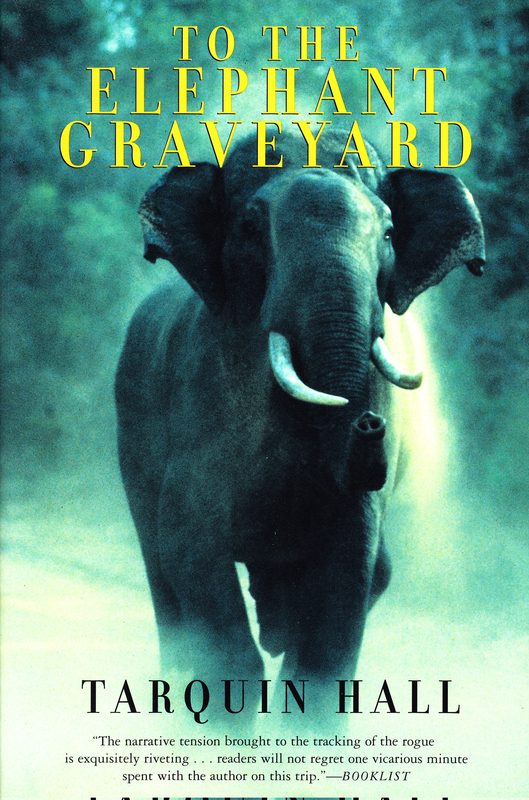 I was reading a nonfiction book called To the Elephant Graveyard . . . and it makes mention of a real-life elephant that used to bury its victims. The elephant would carry the body for miles beforehand, and in some cases, if people tried to take the body away, he would bring it back. Or he would guard the burial site . . .There was something kind of human in its madness, I guess, and I know this is kind of a human-centric way of thinking about it, but there was something recognizable about that madness that made me want to know where that elephant had come from. I wanted to know the tipping point that led to a life as a violent rogue elephant. The Gravedigger was a few years old when it happened, still new to the world, but old enough that his mother had gone and calved another one. The newborn was a clumsy little cowpat. She toddled within the pillars of his mother’s legs precisely where he used to toddle. 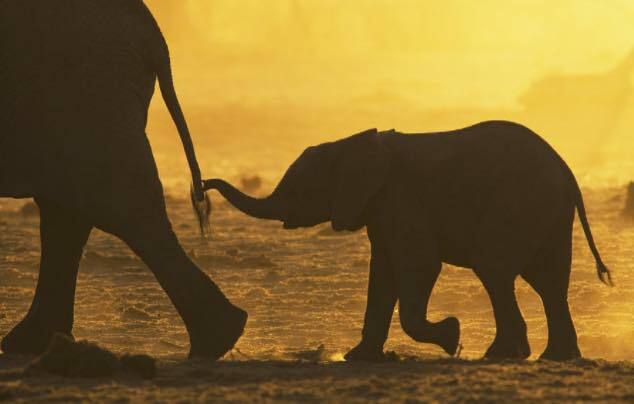 Whenever he tried to double back and regain her shade, his mother grumbled and nudged him onward with her trunk. If he fell behind, she flicked her tail until he grasped it, the two walking in tandem, ever in touch. James includes the Gravedigger’s perspective, but she wisely writes his sections in the third person, implicitly acknowledging that she cannot fully understand his thoughts and feelings the way she can attempt to do with the minds of her human characters. Animal characters in literature generally fall into two categories: either they are stand-ins for human beings, essentially humans in animal bodies, or they are actually animals, experiencing the world around them through an entirely different lens. One problem with novels containing multiple narratives, no matter how seamlessly they fit together– and The Tusk That Did the Damage coalesces very nicely — is that one of the narratives is usually more compelling than the others. That was certainly the case for me in this novel. All the narratives are interesting, and necessary to the novel, but the chapters about the Gravedigger are absolutely mesmerizing. As I was reading about the moral issues facing the filmmakers, the Indian Forest Department, and the poachers, I kept wondering what was happening with the Gravedigger. Who could imagine that an insane elephant, perhaps suffering from post-traumatic stress syndrome, could be an appealing character? Shortly after I finished reading the book, I listened to a news story on NPR about the decision Ringling Brothers and Barnum and Bailey Circus have made to phase out the use of elephants in its circuses over the next several years. The report said that Asian elephants have typically been used in the shows because of their “more tractable nature”. The elephants (called “pampered performers”) will be moved to a conservation center in Florida, where they can live out their days in peace and comfort, just like their human retiree counterparts. 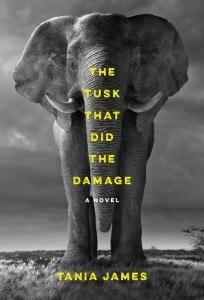 The publisher is offering one hardcover copy of The Tusk That Did the Damage to a Books on the Table reader. To enter, please comment — or email me at bksonthetable@gmail.com. The giveaway will close on Friday, March 27. To read more reviews of The Tusk That Did the Damage, visit TLC Book Tours, and click here for a very informative Q and A with author Tania James. What an interesting novel! I’m adding it to my tbr list, thanks! I just LOVED this book. Thanks for the review. I considered participating in this tour, but ended up sitting out b/c of a packed schedule. And, this review has made me regret that decision! This sounds like a really unique book…maybe I’ll squeeze it in later this year. This sounds intense, but really interesting! I’d love to enter the giveaway, thanks! This sounds lovely and intense. I am a big fan of Tarquin Hall’s Vish Puri series. I never knew he wrote non-fiction as well. It’s amazing that his book inspired Tania James so much. I now need to read both these books. I hadn’t heard about the Ringling Brothers decision but it’s one I support strongly. And I CANNOT wait to read this book! It sounds incredible.